Charles and Ray Eames became the first furniture designers ever to be honored by the U.S. Postal Service. 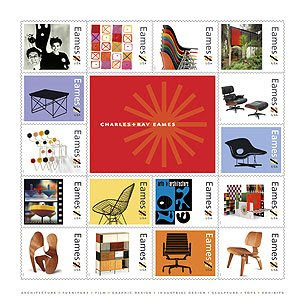 On Tuesday, nearly 300 design fans and stamp collectors attended a ceremony at the Eames Office in Santa Monica, grandson Eames Demetrios says. The commemorative edition of 24 million stamps, on sale for one year, is available in collectible 16-image sheets, as shown here. "It's not just the familiar furniture," Demetrios says. The images include the Eameses' 1947 Crosspatch fabric design, a still from their 1969 short film "Tops" and a photographic Christmas card of the late Santa Monica-based Modernists. Demetrios adds, "What's really cool is that the stamps are like their furniture -- works of beauty intended to be mass produced." The stamps are available from post offices, (800) 782-6724 or www.usps.com/shop.